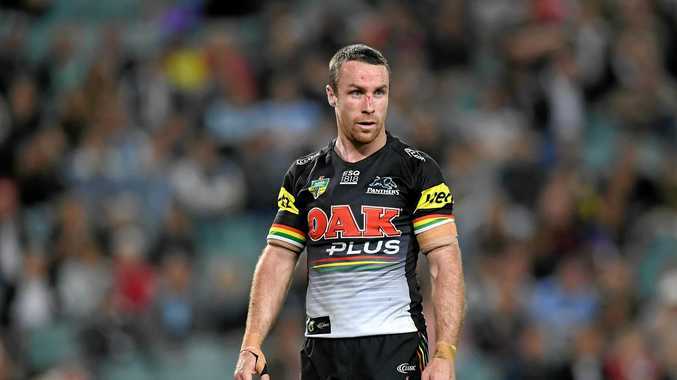 PENRITH playmaker James Maloney has been called out by club premiership winner Ryan Girdler for an "unacceptable" performance. Girdler's comments came in the wake of Friday night's loss to Cronulla, which bundled the Panthers out of NRL finals, at Sydney's Allianz Stadium. The veteran five-eighth made some crucial errors during the game and failed to get his side across the line when it was there to be won late in the piece. Fox Sports Lab credited Maloney for two errors and three missed tackles for the night, but Girdler believed his performance was worse than those numbers. "He's known to be a player that doesn't carry his divots but last night he was visibly upset for the whole game," Girdler told Triple M on Saturday. "He came up with that poor defensive read on (Andrew) Fifita that allowed the first (Sharks') try, he went up the other end, ran off (Viliame) Kikau and dropped the football. "I think all up there was about nine errors in his game, and for the captain and leader of your club to go out and perform like that on the biggest stage is unacceptable. "You can't do that ... you don't keep people accountable, and that's your job particularly on those games. "We know he can get over things, make mistakes then come back and win the game but eventually you're not going to be able to do that, and that's what happened last night. "At some point he needed to pull back and give the reins to (Nathan) Cleary, who was doing a really good job. "There was even times last night where he would jump into dummy half on the fourth play, kick into Cronulla legs and hand over possession. "One of the last plays of the game when they were trying to set for a field goal he goes down the short side and leaves them no option. "He needed to be better last night." Cleary was electric in the second half and, along with backrower Kikau, almost completed a stunning comeback for Penrith.